GBPUSD is in consolidation of the uptrend from 1.4813 (July 9 low). Deeper decline to 1.5700 area to complete the consolidation is possible. Key support is at 1.5700, as long as this level holds, the uptrend could be expected to resume, and one more rise towards 1.6500 is still possible after consolidation. 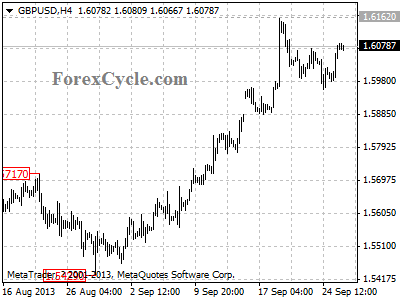 Resistance is at 1.6162, a break above this level could signal resumption of the uptrend. On the downside, a breakdown below 1.5700 support will indicate that the uptrend from 1.4813 had completed at 1.6162 already, then the following downward movement could bring price to 1.4500 zone. 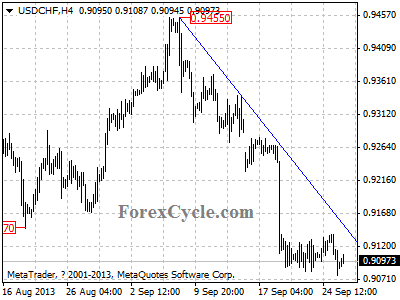 After consolidation, USDCHF continues its downward movement from 0.9455, and the fall extends to as low as 0.9078. Further decline could be expected, and next target would be at 0.9000 area. Resistance is located at the downward trend line on 4-hour chart, only a clear break above the trend line resistance will suggest that the downtrend has completed. USDCAD remains in downtrend from 1.0568, the rise from 1.0182 is treated as consolidation of the downtrend. Resistance is at 1.0350, as long as this level holds, the downtrend could be expected to resume, and one more fall towards 1.0000 is still possible. 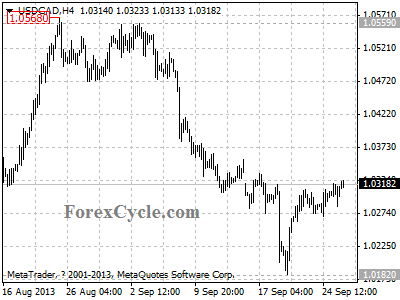 On the upside, a break above 1.0350 resistance will indicate that the downward movement from 1.0568 had completed at 1.0182 already, then the following upward movement could bring price back to 1.0750 zone. 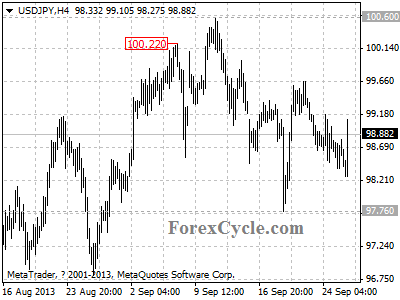 USDJPY remains in downtrend from 100.60, the rise from 97.76 is likely correction of the downtrend. Key resistance is at 100.60, as long as this level holds, the downtrend could be expected to resume, and one more fall to 96.50 area is still possible. On the upside, a break above 100.60 resistance will signal resumption of the uptrend from 95.81, then further rise to test 103.73 (May 22 high) resistance could be seen. 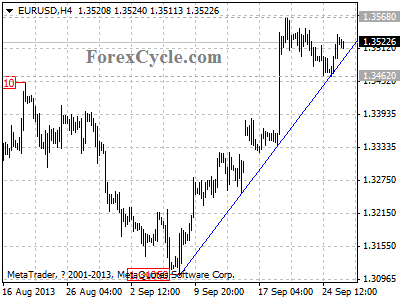 Being contained by the support of the upward trend line on 4-hour chart, EURUSD rebounds from 1.3462, suggesting that the pair remains in uptrend from 1.3105, and the price action from 1.3568 could be treated as consolidation of the uptrend. Further rise is possible, and next target would be at 1.3600 area. Key support is now at 1.3462, only break below this level could signal completion of the uptrend. 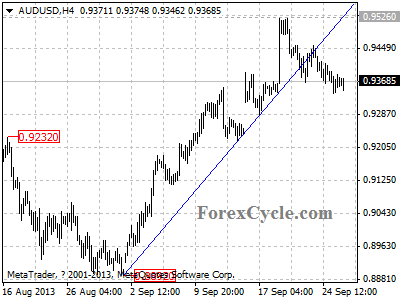 AUDUSD’s fall from 0.9526 extends to as low as 0.9338. Deeper decline is still possible, and the target would be at 0.9300 area. As long as 0.9300 support holds, the fall from 0.9526 could be treated as consolidation of the uptrend from 0.8892, one more rise towards 1.0000 is still possible. On the downside, a breakdown below 0.9300 support will indicate that the uptrend from 0.8892 had completed at 0.9526 already, then the following downward movement could bring price back to re-test 0.8847 (Aug 5 low) support.